One of the motivations for getting one of these el(dirt)cheapo Baofeng handhelds was to investigate if I could make a small (tiny) APRS tracker for use on longish trips in the work vehicle. Several years ago, I had purchased a TinyTrak3 from Byonics for another project. This is a tiny PCB that employs a PIC microcontroller to encode position data from a NMEA compliant GPS and transmit it via a 2m radio, be it a hand held or mobile rig. The fact that you can now pretty much see all of the activity for APRS on a smartphone or tablet at aprs.fi pretty well eliminates the need to view APRS info on an external device that is hard wired to the tracker like say a Garmin GPS unit, and being limited to that units maps and features. The detail and info on a smartphone these days is amazing! as long as your APRS position is gated to the Internet via a digipeater then you’re good to go! this could also be used on a SOTA summit, spewing APRS data as you ascend your next peak in search of Goat glory! The TinyTrak (TT) has evolved since the TT3 I obtained, and there are quite a few different kinds now. Alternatively, the OpenTracker is a similar concept and will also do the trick. The whole thing came together pretty easy. In my case, I used a older a Garmin GPS 16 unit to supply the GPS data to the TT, but any serial GPS that outputs NMEA-0183 compatible $GPRMC or $GPGGA sentence data will be ok. The TT is very configurable in terms of supply voltage and GPS voltage, all jumper selectable. I would imagine that just about any serial output GPS could be hacked into service with the TT. Interfacing to the Radio was relatively straight forward, as the Baofeng UV5R uses the same sockets on the side of the rig for Mic/speaker/PTT as many Kenwood H/H rigs. The Byonics website has a lot of excellent info on cables to and from the TT to your radio for those wishing to wire up something for themselves, or those less savvy could simply cheat and buy the cable! My goal is to have the complete APRS tracker fit in to a kids lunchbox/tupperware style container that just needs an antenna and GPS connected and power to be ready to go. The unit could then be quickly deployed in a mobile situation or taken along on a SOTA summit. 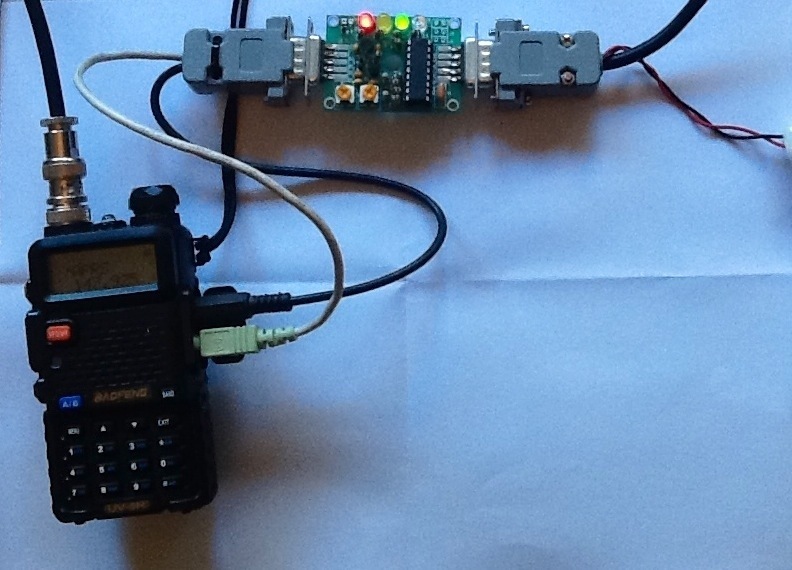 This entry was posted in APRS and tagged 2 Metres, APRS, Baofeng, TinyTrak, UV5R, VHF. Bookmark the permalink. Hi Andy, thanks for writing this post. I am thinking of doing something similar. Just researching the project at the moment. Cheers Tim VK5AV.